They might look like wood, tile or stone, but these synthetic planks need their own special kind of TLC. It's hard not to be seduced by laminate floors: They're stylish, affordable and come in hundreds of different looks, whether you're looking to evoke palazzo tiles or a hardwood herringbone pattern. Some even come with a waterproof finish. And if you're up for a DIY project, you can even install the floors yourself. Laminate planks are made of fiberboard that has a photo overlay of a specific material (such as wood), topped with a protective plastic layer and fused by, you guessed it, lamination. The styles that resemble hardwood are especially popular, but they can also mimic materials like tile or slate. Unlike real hardwood floors, which are fairly easy to repair by refinishing or even replacing individual boards, laminate planks are not — especially if they're the type that's been laid with adhesive — so it's especially important to clean and protect them properly. Here are five ways to keep them looking as good as the day they were installed. 1. Make regular sweeping or vacuuming your go-to cleaning method. For sweeping, trade the classic stiff broom for either a soft-bristle version or a dry microfiber dust mop. If you opt to vacuum, remove the beater brush (also called a beater bar or rotating brush), which can damage the floor's surface. Use a hard-floor attachment if your model has one. 2. Spot cleaning is your friend. Sticky patches — like when your toddler spills juice and neglects to tell you — can be spot cleaned with a microfiber cloth and a spray bottle filled with a water-vinegar solution (one gallon of water mixed with one cup of vinegar). 3. When you do need to mop, think damp, not wet. Excess liquid can seep into laminate planks and cause warping over time. When you mop, use a barely-damp microfiber mop with the water-vinegar solution described above. 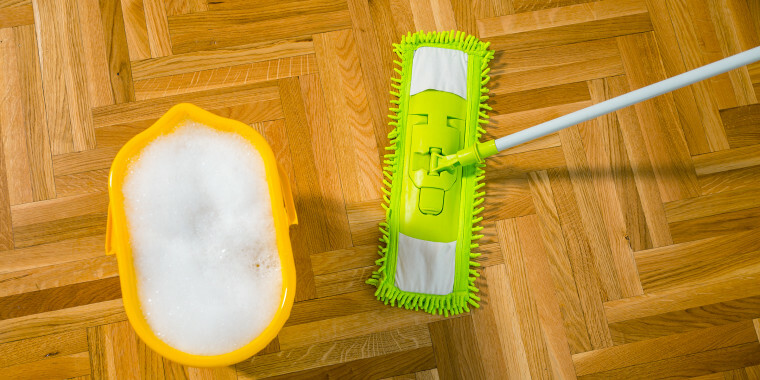 String and sponge mops as well as Swiffers should be avoided since they can leave streaks and also potentially oversaturate the floor and cause damage. Start with just a small amount of liquid on the sponge mop; never pour it directly onto the floor. You can also use a small amount of cleaning solution made specifically for laminate floors (check your manufacturer's website for a recommendation), but avoid soaps and detergents, which will leave a slippery residue. 4. Clean up spills quickly and dry your floor thoroughly after mopping. Remember, liquid and laminate don't mix well. To wipe up surprise spills or dry the floor after a mopping session, use a clean, dry microfiber mop (it makes sense to keep a few on hand). Stains such as red wine or ink can be cleaned with a small amount of nail polish remover or rubbing alcohol, but test in an unobtrusive area first. 5. Take protective measures, like banning stilettos. Place mats or small rugs under potentially leaky objects like houseplants and pet bowls and use adhesive felt pads on the undersides of furniture to protect the floors from scratches. High heels can leave irrepairable pockmarks in laminate floors, so it's smart to make a no-shoe policy for family members and guests. It also protects your floor from excess dirt and sand, which can damage it over time — not to mention the crazy-high amounts of bacteria one pair of shoes can acquire in a single day. Looking to clean more than just laminate floors? Check out our guide on cleaning any type of floor, including hardwood, carpet, tile and more.